Compare the latest offers, deals and vouchers on Primitivo wines from top UK merchants. Find your favourites using our search filters, look for awards and reviews to get the best quality at the cheapest possible price. Sign up for Price Alerts and we will email you when your chosen bottle goes on sale. For decades, if not centuries, Primitivo has been the main red grape variety used to produce high volumes of southern Italian red. However, its history is far more fascinating than that. A few years ago, it was claimed that California’s own red grape, Zinfandel, on which they stake much pride, was in fact, the Italian Primitivo. Amidst lots of excitement and some perturbation from the Californians, further research was undertaken, and it emerged, in recent years, that both Primitivo and Zinfandel originate from a barely known, and even less pronounceable Croatian grape variety, Crljevak Kasteljanski, which was brought to both southern Italy and California, by Croatian immigrants. Therefore whilst it has now been proved not to be the same grape, the links are unquestionable, and there are many similarities in style. The Primitivo grape, is a dark-skinned grape, grown prolifically in southern Italy, especially Puglia. For centuries, it has been the workhorse of the south, producing high volumes of full-bodied, inky, alcoholic red wine. It originates from the Primorska Hrvatska region of Croatia, and was imported by immigrants, who also took it to California, where is became California’s own, under the name of Zinfandel. As its name suggests, Primitivo, means early ripening, and the best wines are made when the grape is picked still young, ripe, but without having become overripe, too concentrated and over high in potential alcohol. Primitivo has created a name for itself within only the last 10 years, as winemakers have spotted the potential for this grape. With improved winemaking techniques and vineyard management, Puglia is now producing some top quality Primitivos, with attractive fruit, and an affordable, rich, appealing style. The Primitivo grape has thick dark skin, ripens early, and produces naturally full-bodied, tannic wines, with high potential alcohol levels. Made badly it is hot, alcoholic and very tannic; made well, it produces enchantingly spicy,rich moreish reds, which offer fantastic value. The wines are bold, and full-bodied, packed with ripe, brambly black fruit, a mocha spice edge, and big, licorice and herb spiced flavours. Alcohol levels are naturally high. The Primitivo grape originated in the remote area of Crljevak Kasteljanski in Croatia, but its home is really Puglia, deep south in the heel of Italy, where it is grown and used both in blends, and now, increasingly, as a stand alone varietal. 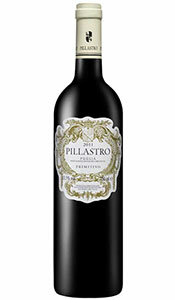 Primitivo is a great food wine – the rich, intense fruity style and full body of the wine is designed to accompany food. Because of its ripeness and fleshy style, the tannins are well integrated, and suit rich, bold dishes – pasta with meatballs, lasagne, Bolognese, all these work, as do the rich dishes of the south, with roasted vegetables, and rich tomato based sauces. Primitivo is also great with roast lamb, braised meats and casseroles, warming winter pies, and superb with a plate of mature cheese.